Tired Dave, zombies of the teenage lumbering variety are notoriously difficult to wrangle. How did you manage? Those teenage zombies have hollow legs too, it's nearly impossible to keep enough human brains for them! Did not have much time to set up my own traditional ancestral displays, so hung with a neighbor (does video production, had a lot of cute special effect tools) and produced, or added, blue fairies from kids' bags. So simple, so much fun, adding to happy memories, priceless. Put together a last min. 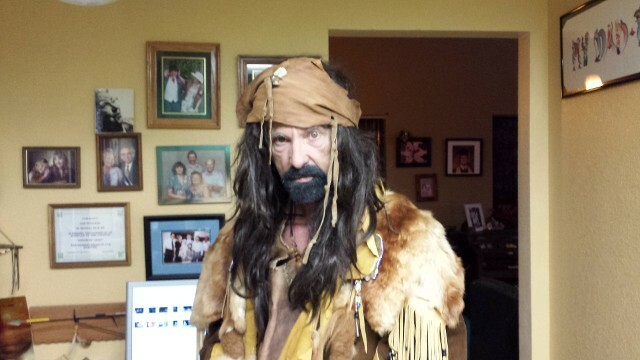 mountain man/fur trapper outfit, but most kids thought it was either Jonny Depp, or Captain hook, so hell with it, went with pirate/Tinker Bell-blue fairy, worked better anyway, as for some reason, these spoiled suburban kids didn't want to interact with the dead beavers. Bal, the costume is fun. It seems to be less pirate and more Liver-Eating Johnson, though. Cannibal Jean-Claude it was David, nail-on-the-head. Only survivor of the doomed '86 Ottawa Party, he returned with the tale of the tragic loss, and surprisingly robust. He now had several spirit "helpers" or as he says, he can just feel their presence "in his gut". The children were allowed a chice of a few dead animals--skunk, bever, rabbit, racoon, and rat, and Jean-Claude, tho back was turned, thanks to his spirit helpers, would be able to discern their choice. Plush toys, I effected them further to look more gross and road-killy, ok, it may have been overdone, but still, common! Halloween, hello? Mostly very young kids this year, they weren't interested to handle the dead things, said "euuuu!" a lot, and were aided by their parents to just say no. And the headband said "pirate" to them. So--used a d'lite and had some blue fairy fun anyway. One group of teenagers--one group only came by--got to play with the dead things, got the costume and the quick back story, and had a laugh. So there is yet hope for the future. Who you foolin Bal, that's your everyday clothes. I smoked some old stale opium and watched Rocky Horror 3 times in a row. I would have changed the channel but I couldn't reach the remote way over there by my right hand.